Sharpshooter: a marksman, or one skilled in shooting. This label has carried through each war, even into present day. The term became well-known for Alexander Gardner’s photograph, “Home of a Rebel Sharpshooter,” photographed in July 1863 (right). 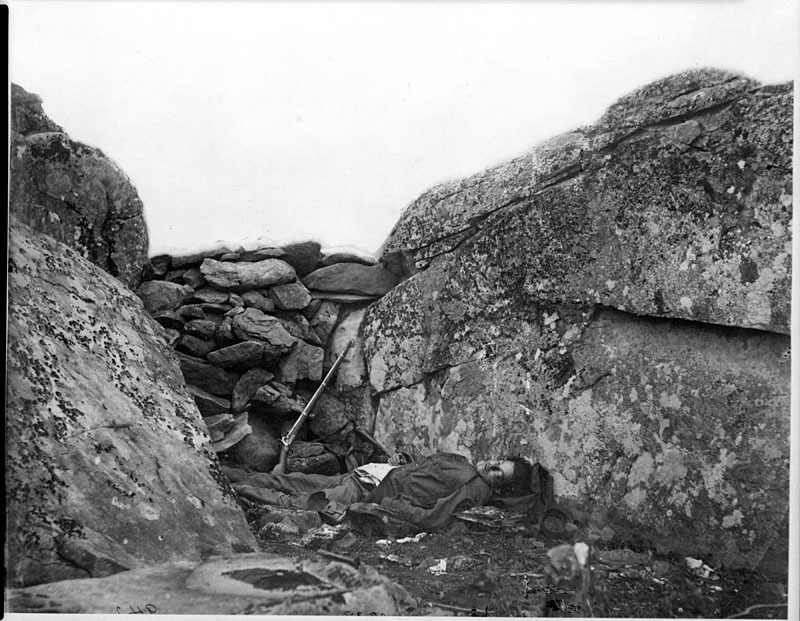 The image depicts a man lying dead between two rocks. “The sharpshooter had evidently been wounded in the head by a fragment of shell which had exploded over him, and had laid down upon his blanket to await death,” Gardner writes in “Gardner’s Photographic Sketch Book of the War 1865-66” (compiled version of the book here). The term also went hand-in-hand with the Sharps breechloading rifle for its accuracy, invented in 1848 by Christian Sharps. So which explanation prevailed to coin the term “sharpshooter?” Neither. “‘Mounted sharpshooters’ is the phrase so used in James’s Universal Military Dictionary (1802),” Dickson writes. However, the Sharps rifle most likely contributed to the popular Civil War term we still use today.